The Lachlan catchment covers an area of 84,700 km2, running from Crookwell and Gunning in the east to Oxley and Ivanhoe in the west. The Lachlan River rises near Yass and flows for approximately 1450 km to the Great Cumbung Swamp, northwest of Hay. Water from the Lachlan reaches the Murrumbidgee only in high flood years. The main storage is Wyangala Dam, upstream of Cowra, with a capacity of 1,217,000 ML. 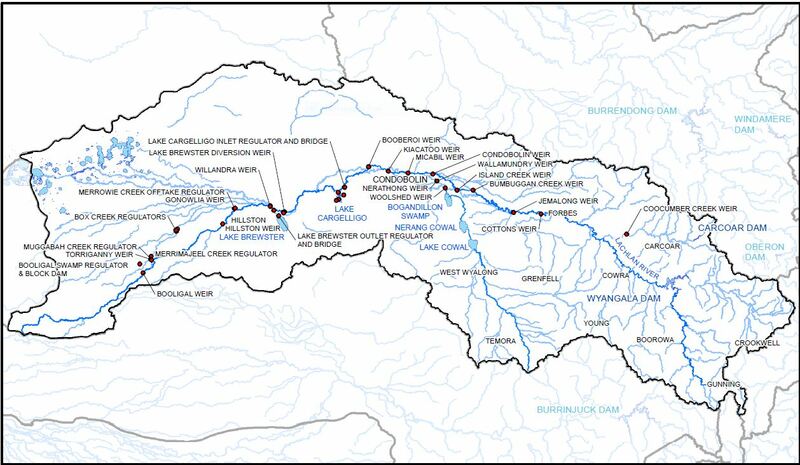 Other storages are Carcoar Dam on the Belubula River (36,000 ML), Lake Cargelligo (36,000 ML) and Lake Brewster, between Lake Cargelligo and Hillston (153,000 ML). Average annual surface water flow is estimated at 1,212,000 ML (Water Sharing Plan for Lachlan Regulated River 2003). The Water Sharing Plan limits average annual usage to 305,000 ML = 25% of long term average annual surface flow. Total water usage for both surface water and groundwater is around 450,000 ML per year, depending on water availability and seasonal conditions. Around 1% of the total catchment area is irrigated and in 2001 irrigated production had a farm gate value of $270 million, or 21% of the total agricultural production from the catchment. The Lachlan is well known for high quality lucerne hay production, and also grows a diverse range of crops including winter and summer cereals, cotton, canola, grapes, potatoes, citrus, vegetables and other horticultural crops.